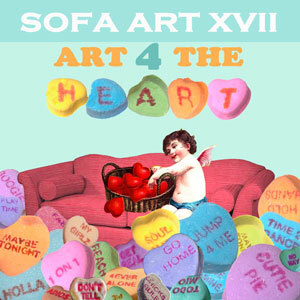 Sofa Art returns in February for the seventeenth consecutive year and promises to be a memorable one as Arts Visalia partners with Pro-Youth/Heart in bringing this year’s theme: Art for the Heart. In addition to our open call for artwork entries from artists (and non-artists!) throughout the community, Pro-Youth/Heart will be inviting a selection of community “celebrities” to display artworks which will be sold by silent auction in support of their afterschool youth education programs. The exhibition will run from February 1st through February 24th. An opening reception will be held Friday, February 3rd from 6 to 8 pm. Attendance is free and open to the public. All artists, and, again, non-artists, are invited to submit their creations. Entry forms may be picked up at Arts Visalia or online at www.artsvisalia.org. Artwork submissions must be delivered to Arts Visalia by Saturday, January 30th. A dedicated artwork delivery session is scheduled for Saturday, January 28th from Noon to 3pm.